We’re pretty familiar with the saying: If you fail to plan, you plan to fail. I find that’s a pretty common sense observation, since achieving results depends on making specific short and long term plans–even down to daily routines. If I truly want to get everything accomplished, I’ll make an hourly schedule. Such plans are flexible: gardening might take all morning, so the yoga and weights will be moved to the next day. No guilt involved since calories were burnt up by all the gardening and housework, right? 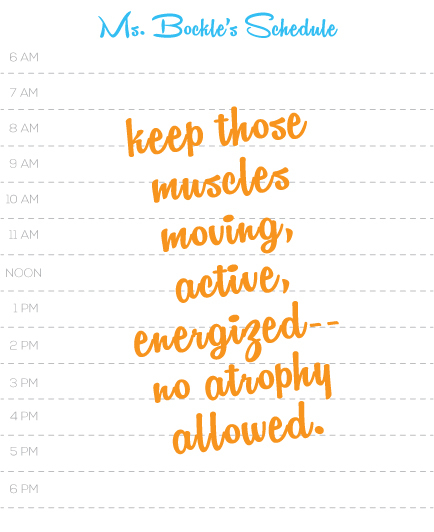 I’m mindful everyday that I need to keep these muscles moving, active, energized–no atrophy allowed. My journal also gets used for weekly plans–especially if I’ve got deadlines that need to be met, or am responsible to others. When I made my new years’ resolutions, I even made a plan for all 12 months, but did not follow it as hoped: maybe I should’ve made them more visible?? I have discovered that even when accomplishing whatever’s on the ‘to do’ list, sometimes those self-imposed pressures result in tension and stress. That simply means that some quiet ‘down time’ activity needs to be scheduled in–together with forgiveness for not being able to cross things off. Whatever the outcome of the schedules, I am confident that with my mind focused on being active, I’ll be pain-free, strong, energized, able to create, produce, breathe, have fun, and relax when necessary. Phew, must be time for bed. Are You Going to Run Today?